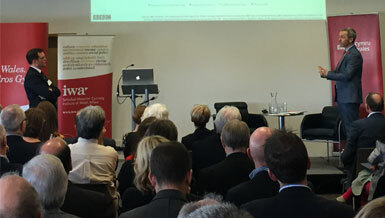 I had the pleasure of chairing the second Cardiff Media Summit on the 11th November at the Wales Millennium Centre. The first summit was held in December 2014, a half-day event. It was clear then that in order to address the problems and take advantage of the opportunities facing the media in Wales there was an urgent need for objective facts as the basis for policy recommendations. Just under a year later we have the IWA Wales Media Audit 2015 , launched at the summit. This is an update to the Media Audit done by the IWA in 2008. The 2015 Audit offers information about provision in Wales of press, online and broadcast media, includes a review of all major policy statements since the last audit and, drawing on the information gathered, makes 37 recommendations. 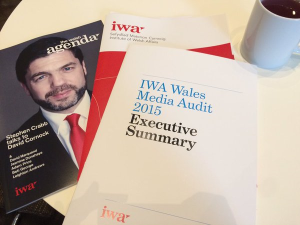 “The new IWA Wales Media Audit is a brilliant pull-together of things you never knew, things you thought you knew and things you once knew but, you know what, you’re out of date. I’m not sure how we got by in the seven years since the last IWA audit, so get reading and rejoice in this thorough and classy piece of work. Now we can all compare figures for Wales sign-ups to Twitter and Facebook against the numbers for Wales Online, the Denbighshire Free Press, the BBC and ITV. Check out the proportion of people in Wales who have access to broadband – 78% – which puts Wales level with the UK average. As a bonus, you get the IWA’s thinking about what needs to be done to enrich the Wales-facing content available in this digital jungle“. The Guardian’s Maggie Brown reported on the audit from the summit. Justified demands for better coverage of Wales in the English language on the network and ‘at home’ cannot be met by more money, according to James Purnell. 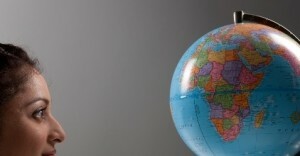 He was obliged time and again to proffer ‘creative’ resource management and dialogue as the only responses. There were afternoon discussion sessions on Radio, Independent Production, Television and Press. Although the current BBC Charter review necessitated some prominence for the BBC this is not to say that there aren’t other urgencies! S4C’s position, the contribution of ITV Cymru Wales, convergence of media, consolidation in radio… it has never been more obvious how inter-related media are and how important is research into their developing relationships and service to audiences and users. I did a short overview of the media situation for The Wales Report (@20.24) which led into an interview by Huw Edwards with James Purnell. The IWA Media Policy Group had particularly striven to have representation form the media research arms of the Welsh universities. Seven of the eight universities of Wales staffed stands with poster displays to demonstrate the range and vitality of work done on the country’s media. The contributions of academics to the discussions was very valuable and this collaborative presence an important bridge between industry and academia. The presence of representatives from the worlds of business, health, the law, community engagement, the arts and other interests was a welcome sign of involvement beyond the ‘meeja’ encampment.